Tall mass timber is an industry term to identify mass timber buildings, constructed of mass timber elements, that exceed current height limits for wood buildings set by the International Building Code. Mass timber includes any product currently permitted for use in Type IV construction, such as Cross Laminated Timber, Structural Composite Lumber, glued-laminated timber, and large section sawn lumber. A team of fire experts from the U.S. Bureau of Alcohol, Tobacco, Firearms and Explosives (ATF) working alongside scientists from the U.S. Forest Products Laboratory put identically furnished, multistory, one-bedroom apartments constructed of exposed, partially exposed, and unexposed (protected) five-ply cross-laminated timber (CLT) through a series of rigorously monitored fire tests. 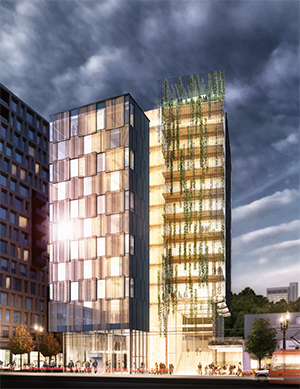 The tests provided valuable data that was used in the development of code change proposals submitted by the ICC Ad Hoc Committee on Tall Wood Buildings (TWB) for the 2021 International Building Code. A series of five tests were conducted. Each test was designed to replicate real world conditions across five scenarios. Identical, furnished, one bedroom apartments were constructed in a multistory building. The door between the living and sleeping areas was left open in both apartments. A three minute video capturing the highlights of each test is included in this playlist. Compartment fire research was conducted to evaluate the contribution of mass timber elements to building compartment fires with the types of structural systems that are expected to be found in tall buildings. The mass timber elements used this research is Cross Laminated Timber (CLT). Fire tests were conducted to simulate conditions where the automatic fire suppression system has failed to activate the fire service was unable to intervene. The contribution of exposed timber elements to a compartment fire was evaluated for a full fire duration using metrics such as charring rate, visibility, and temperature. The generated data would allow regulators and building designers to quantify the contribution from exposed timber elements, validate design equations, and develop fire protection strategies to mitigate the level of risk to occupants, fire fighters, property and neighboring property. 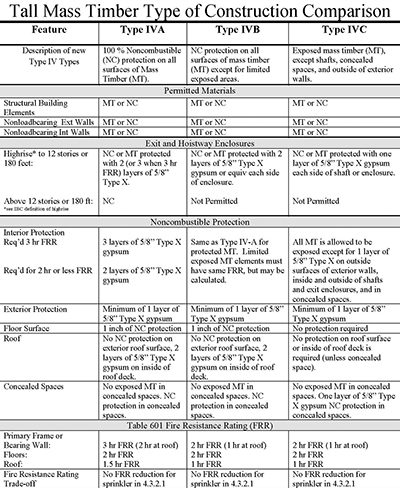 In addition, the benefits of adding noncombustible protection to timber elements as passive fire protection to prevent or delay involvement of timber elements in fire were characterized. 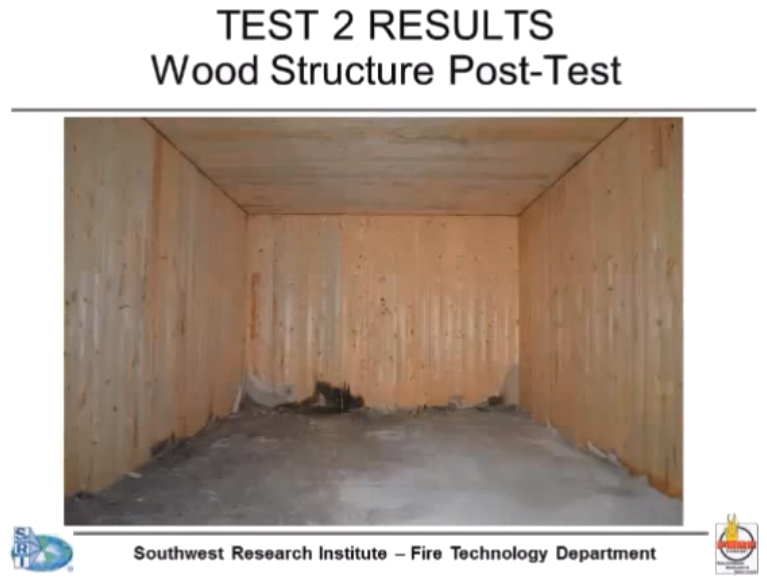 This CLT compartment fire research was conducted jointly by the National Institute of Standards and Technology, USA, and the National Research Council, Canada, and the Research Institutes of Sweden. The research program was coordinated by the National Fire Protection Association’s Fire Protection Research Foundation. The research was jointly funded by a grant from the US Forest Service’s Wood Innovation program, the Property Insurance Research Group, and the American Wood Council. Fire Safety and Protection: During the planning, construction, and occupancy of a building, fire safety is a priority. 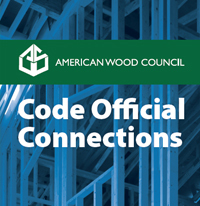 Code Official Connections is free to qualified governmental employees and is designed for the professional needs of the code administration and enforcement community. On behalf of the industry it represents, AWC is committed to ensuring a resilient, safe, and sustainable built environment. To achieve these objectives, AWC contributes to the development of sound public policies, codes, and regulations which allow for the appropriate and responsible manufacture and use of wood products. We support the utilization of wood products by developing and disseminating consensus standards, comprehensive technical guidelines, and tools for wood design and construction, as well as providing education regarding their application. 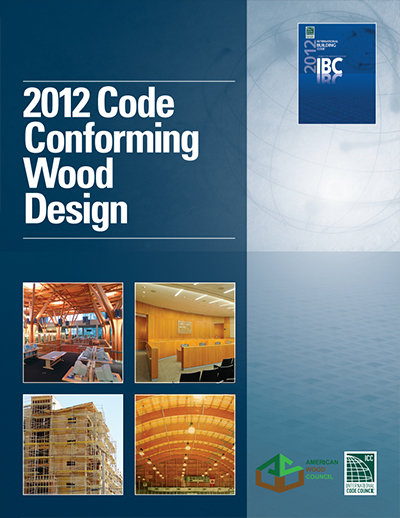 Resources for code and fire officials on fire performance of wood products.